In a previous posting here I referred to Edward Hopper as the liberal art establishment's answer to Norman Rockwell. I got no disagreement. I pointed out some surprising similarities between he two artists and needlessly underlined their differences (as in day and night). 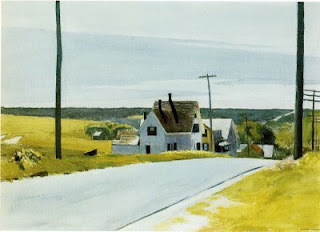 Even though I like both artists' work, Hopper is much harder to like. 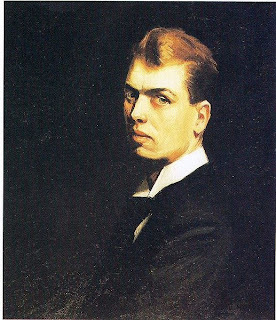 With Hopper you have to "feel" the artist--get under his skin, so to speak. In many ways Hopper could also be compared to Grant Wood--quiet, austere, probing, but not quite as cold and without the dry humor. Hopper goes out of his way to be profoundly humorless. He instead, dwells on contrasts--wordless contrasts and color contrasts. ﻿Words are superfluous in Hopper's subject matter, indeed, almost a sacrilege, like bubble gum in church. No words are needed to heighten the solitude of Hopper's 1927 Automat (left), or the silent, joint solitude of his 1942 Nighthawks (below). No one ever speaks in Hopper's paintings. In his landscapes, only the wind dares break the silence. No TVs blare in his bleak, Midwestern hotel rooms. No passing cars, not even a car horn invades his city streets. His figures avert our gaze, lost in thought, but never thoughtless. They are as silent as his architecture, and as motionless. And like his architecture, whether starkly Victorian or starkly Modern, they seem just as starkly noble in their timeless, mundane worlds. ﻿Balancing the contrasts of his subjects is his color contrasts. His is a world of sunlight seen through dilated pupils--pure, unadulterated whites blatantly smashed against deep, colorless blacks. But in between is a walloping palette of fire engine reds, strident yellows, rusty browns, and patriotic blues sufficient to make even Claude Monet rub his eyes in amazement. And there is the greatest contrast of all. 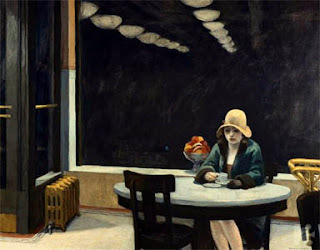 Despite the almost photographic realism, Hopper colors like an Impressionist. In peering at his colors, between the sometimes excruciating high contrasts, one finds a quiet, wealth of breathtakingly subtle transitions--an intermingling of his daunting primaries into an endless array secondaries too rich to merit such a term. 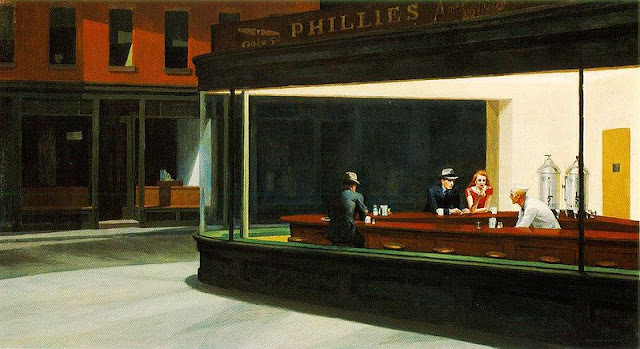 Hopper's paintings, unlike Rockwell's, demand respect, not love.